A rug for your mug and a snack. Genius! Have you heard of Mug Rugs? I hadn't, until recently. They're bigger than a drink coaster, but smaller than a placemat. 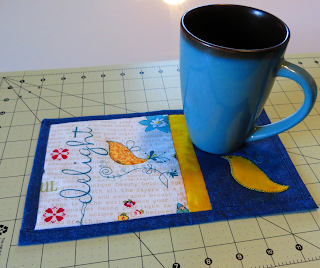 Mug rugs are the perfect size to rest a teacup, or mug and a snack on them. Cleanup is easy since most are machine washable. I like the idea of having these for when my granddaughters come over and have snack time. Best of all, they're a great way to use up my mound of fabric scraps. Okay, I confess. It's now more of a mountain. Everest comes to mind. I can't see throwing away any piece of fabric. It seems so wasteful when I can use it down to an inch in size. That being so, I need more projects in order to get that mountain back to mound status. So, pictured above is my first mug rug. It measures 6" x 10". 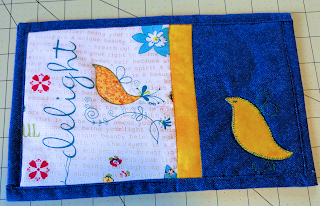 I just love the bird fabric. It's background is covered in words of encouragement. Words of encouragement grace this lovely fabric. The fabric is 100% cotton. 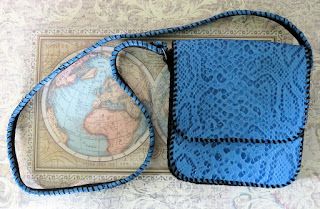 There is a top layer, batting in between and a bottom layer that matches the denim patterned fabric on the top. For a little more detail, I made an applique similar to the printed bird and placed it on the right. 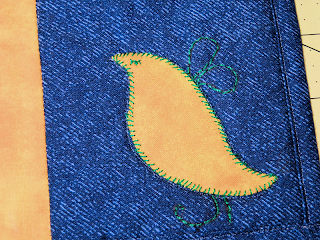 A little close-up of the applique bird. This was a lot of fun to make. I have plenty of ideas for more. 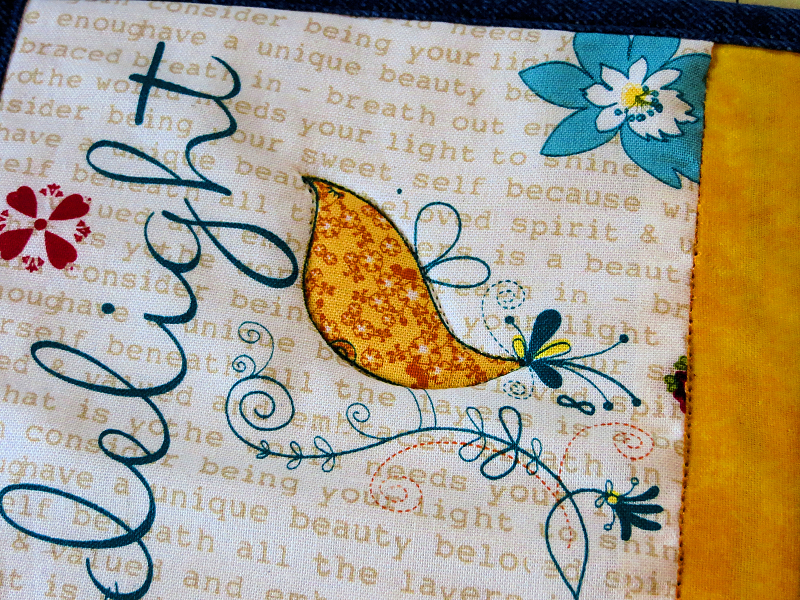 Delight Bird Mug Rug by trgatesart. 6"x10"
If you're interested in the Mug Rug in this post, Click Here to visit my Etsy shop. 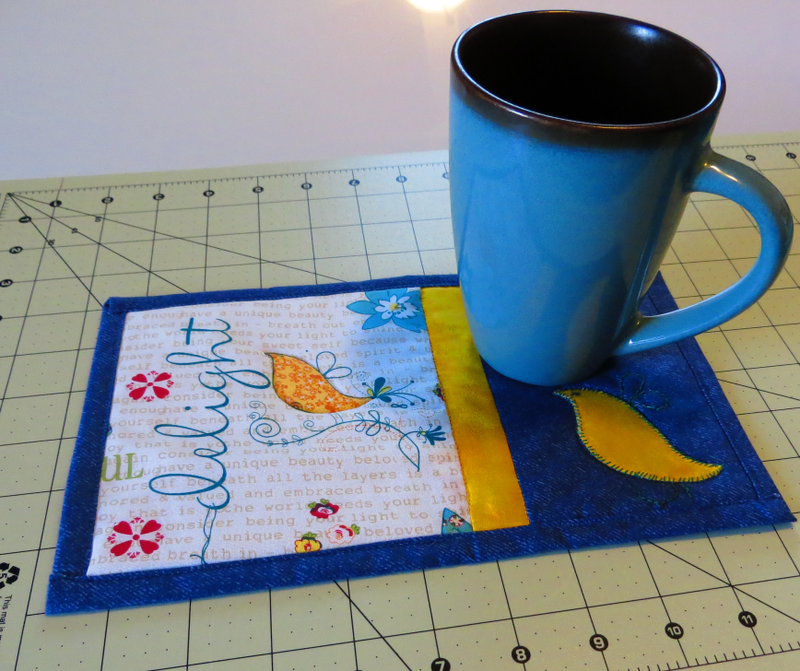 More Mug Rugs are on the way! I'm an artist. What does that mean? Well, anything, really. I love to create. Paintings, plaster, leather, metal, fabric... You name it, I've probably tried it. If I haven't, I most likely will want to at some point. I love learning and experimenting with different mediums and techniques. When I get bored with one, I move on to another. Yet, eventually, I'll return to a previous technique, or material to start all over again. Of course, this means I have a studio full of crafty supplies. Which in turn means I have too much supplies and too little space. It's hard to toss out even the tiniest of scraps. Hey, it happens with crafty, artsy people. I suppose you could call us hoarders, but at least we find a use for everything. Eventually. Don't laugh, or scoff. It's true. I swear! These are some of Halloween my designs available on fabric through Spoonflower. Excuse the wrinkles in some. Also, the colors from the camera seem muted online for some reason. Each of these designs can be printed on the many different kind of fabrics offered through Spoonflower. 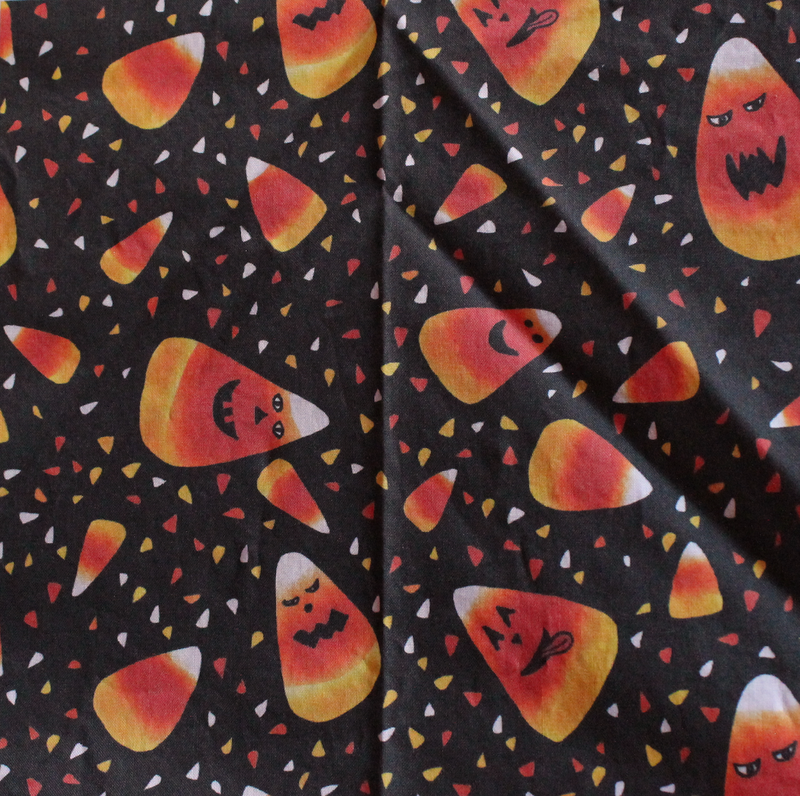 "Halloween Candy Corny" and "Halloween Pumpkin Faces" were printed on Premium Quilting Weight Kona 100% cotton. "Halloween Spooky Tree" was printed on Eco Canvas, 100% polyester canvas with 45% recycled content. "Halloween Spooky Moon" was printed on Performance Piqué. This is 100% polyester fabric with moisture-wicking, soil release finish. There is a 50% cross-grain stretch with this fabric. It's silky and somewhat shiny. My daughter is a fan girl of... Well, a lot of things. Harry Potter is one of her long time favorites. It started when her grandmother brought home the first book (before any talk of a movie). Then took off from there. My husband and I wanted to do something handmade for her birthday this year. Some of the hardest things to find for the Harry Potter universe are items with Hufflepuff, or Ravenclaw on them. (Although, I hear that's starting to change.) 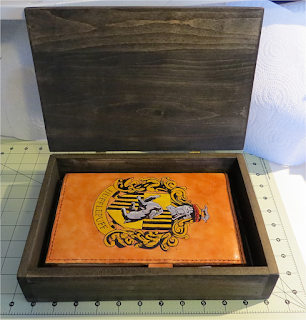 And, since she found out she'd be put into Hufflepuff according to "Pottermore", and she loves to write, we thought we'd make something along those lines. This is what we came up with, inspired by Harry Potter. It started with the journal. This was my part of the gift. Hand sewn pages and dyed leather. Hand carved and painted crest on the front. Two loops on the sides hold a pen and keeps the journal closed when not in use. It came out better than I imagined.